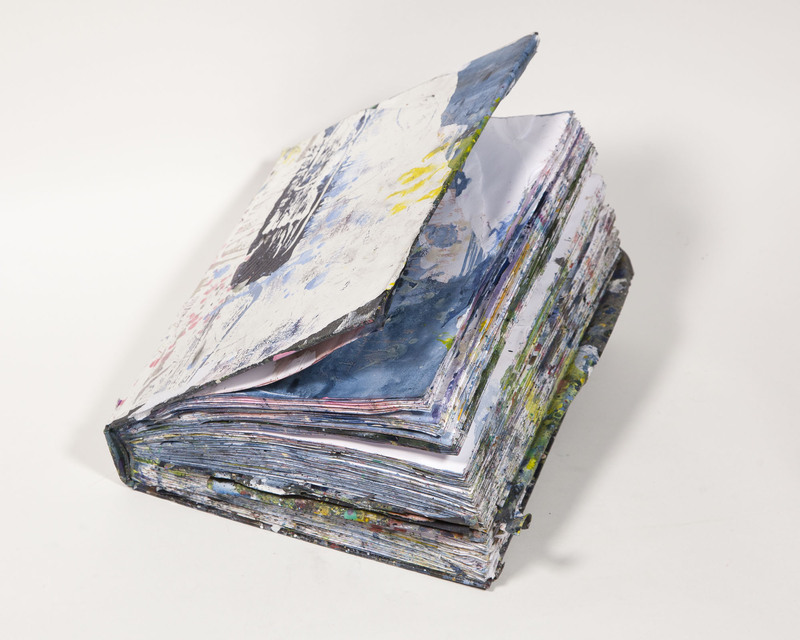 Note Book Project and Show opening tonight! “Journey into Abstraction” was started in December 2014. I was beginning to explore non-objective abstract painting. I would lay out 20 or 30 pieces of paper at a time, some of it re-purposed prints, some new paper; I worked mainly on the floor, using acrylic paint, watercolor, charcoal, graphite, water based oils, reacting to marks and colors. When I started thinking too much the work was ruined. I am interested in Wabi Sabi philosophies and kept the ideas in my mind as working; mistakes became the work, running off the edges, stream of consciousness, making marks from my gut. Out of hundreds of paintings I selected my “most successful” and put them in this journal. It is a documentation of time and exploration of paint. “The Lives of the Painters” began in the actual book, The Lives of the Painters. It was an old book my mom had; I found it at her house after she had died. I always wanted to do something with it but was intimidated to work in a “Book”. I got acquainted with the process in an old medical dictionary that was part of a colab GAP book. Carl had made a few marks, then passed it to me. Every day I painted I would paint in that book as well, or draw. I passed that book back to Carl and we started two more collaborative books that belonged to the same batch of old books I found at my mom’s house. One was an Italian Poem book. Working in these books, I felt connected to my mom, I thought about how she would have loved to participate in this project. I started my solo, “The lives of the Painters” almost a year ago. The first thing I reacted to was the book was filled with male artists only. I got mad several times and too aggressive with the book. It didn’t take long before the whole binding was ruined and fell apart. I was disappointed. But I decided to use a black artists sketch book like I did in “Journey Into Abstraction” to save what I could, which turned out to be a lot. In this book I added collage and work on both sides of the pages. I would attach one side and respond to it on the other page, much like we do when working collaboratively with another person. I was very happy with the end result. I never work in my studio now without working on my notebook projects. It’s part of my process. I would like visitors to the gallery to feel free to look through my books, take time with them, touch them.